Author: Judith de Patoul and Claire Foullon at the Centre for Geophysical and Astrophysical Fluid Dynamics – University of Exeter, UK, and Pete Riley at the Predictive Science, USA. The changes in the configuration of the solar coronal magnetic field impact a number of processes, from the dynamics of solar coronal phenomena to acceleration and properties of the solar wind. 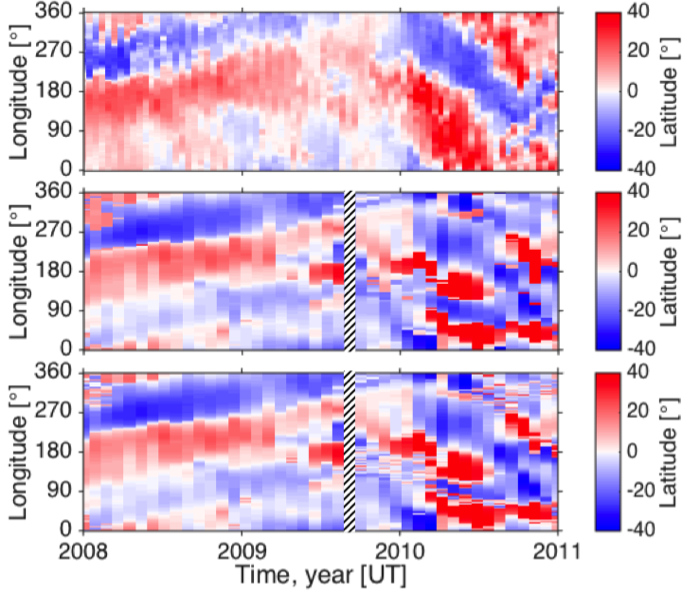 Reconstructing and monitoring the large-scale 3D magnetic field is not straightforward and requires advanced techniques, in particular above the solar polar regions where coronal observations and photospheric measurements are generally less reliable due to projection effects. The 3D electron density distribution in the corona is related to the global configuration of the magnetic field, and so knowledge of the density distribution can serve as tracer of the magnetic field shape and its morphology. It can also provide valuable constraints for coronal modelling and on initial conditions for solar wind modelling. In this nugget we present two methods to estimate the distribution of the electron density in the corona during the solar minima in 2008-2010 (solar cycle number 23/24): a time-dependent tomographic method and a theoretical magnetohydrodynamic (MHD) method. We compare the general morphology of the high-density structures and their temporal evolution and discuss whether they are aligned with the heliospheric current sheet (HCS). Since 1996, the SOHO/LASCO-C2 coronagraph has been continuously producing white-light images of the corona with a field of view ranging from about 1.5 RSun up to 6.5 RSun. The polarized brightness images extracted from the LASCO-C2 images are dominated by the electron-scattered K-corona. To estimate the 3D density distribution from a set of images we need to solve the inverse problem known as solar rotational tomography. Here we use a newly developed time-dependent tomographic method [1, 2] with the LASCO-C2 observations devoid of coronal mass ejections. Figure 1 (left panel) shows the resulting estimation of the density at 3.5 RSun. The movie associated with Figure 1 shows all the tomographic reconstructions performed every 4 days on a set of images collected during half a rotation (14-15 days). The blinking effects observed in the results are due to some rapid temporal changes that the method could not resolve accurately. Global MHD models can also provide an estimation of the density distribution in the corona . While tomography does not require any prior knowledge of the coronal magnetic field, MHD models are based on line-of-sight measurements of a radial magnetic field at the surface of the Sun. Here we compare our tomography reconstruction with a polytropic MHD model (pMHD), which uses the magnetogram from SOHO/MDI and a simple adiabatic energy equation. This model gives a good qualitative description of the coronal structure, however the plasma parameters such as the density estimate are less realistic due to the simplified energy function. The pMHD models are available for each Carrington rotation (27.27 days). The resulting density distribution and radial magnetic field models are shown in Figure 1. The transition from one solution to the other is not smooth and relatively strong discontinuities are visible in the movie. The density values found for pMHD spread over a narrower range and overestimate the tomography values by an order of 4 for the maximum values and up to 102 for the minimum values. Our comparison illustrates the extent to which the plasma parameters predicted by the pMHD model are not realistic. Figure 1: Left to right, the density distribution estimated with tomography, density distribution predicted by the pMHD model and radial magnetic field extrapolated using the pMHD at 3.5 RSun. The date and the Carrington Rotation (CR) number correspond to the central meridian longitude. Note that there is no pMHD result for CR 2086 owing to the missing SOHO/MDI synoptic map. Do the high-density structures always follow the HCS? In the movie we can see that the density distribution in tomography corresponds roughly to the distribution predicted by the pMHD model. The denser regions, presumably above active regions, spread more in latitude when solar activity increases, as we also observe in Figure 2. The rising of the solar cycle toward the end of 2009, with the emergence of new sunspots at higher latitudes, results in spreading the highest-density structures across more latitudes. We can observe in the movie a very good agreement between the location of the highest density regions in pMHD and HCS defined by the region that separates the polarity from north to south in the pMHD solutions (where radial field is the closest to zero), but it is not obvious that the denser regions in tomography always correspond to the HCS. Figure 2: Top panel: Sunspot number (SN) showing the cycle of solar activity. (Source: SILSO World Data Center, 2015). Bottom panel: Latitude-time map of the highest density structure over longitudes obtained from tomography at 3.5 RSun. (Adapted from ). To investigate whether the density maximum and the HCS agree or differ with time, we estimate the location in latitude of the highest density structures in all the tomographic reconstructions and pMHD models (Figure 3, top and middle panels). The latitude of the HCS is extracted from the pMHD model of the radial magnetic field (Figure 3, bottom panel). Figure 3: Relations between electron densities and the HCS during the 2008-2010 solar minimum. Longitude-time maps of the latitudinal locations of the density maximum at 3.5 RSun from tomography (top panel) and predicted by pMHD (middle panel). Latitudinal locations of the HCS predicted by pMHD 3.5 RSun. The values of the latitude have been truncated above 40° in absolute value. The black and white strips correspond to lacking pMHD solutions. (Adapted from ). Close to the minimum of solar activity, from 2008 to mid-2009, the tomographic highest-density structure generally follows the predicted HCS. This can be observed thanks to longitudinal drifts with time toward higher longitudes. The tomographic and pMHD methods consider the exact Carrington rotation rate of 13.20°/day for the whole Sun, whereas the well-studied differential rotation observed on the surface measures a faster rotation close to the equator between ±30° latitudes and a slower rotation above |±30°|. This positive longitudinal drift means that during the extended minimum, the structures rotate 0.25°/day faster than the Carrington rotation rate, which is consistent since the highest-density structure is concentrated between ±30° latitudes near the equator. 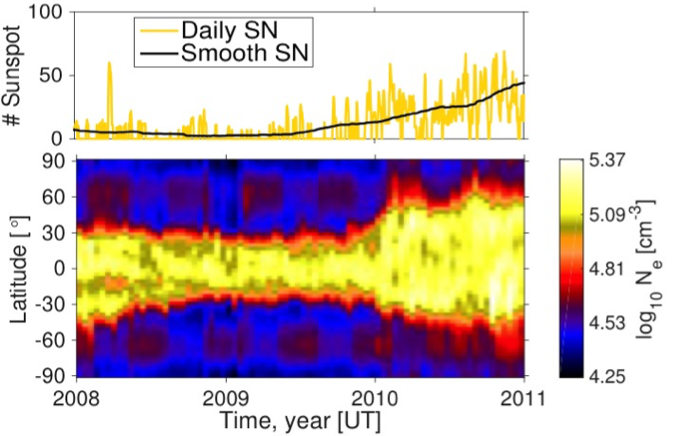 On the other hand, during the rising phase of the next solar cycle starting toward the end of 2009, we observe that the highest-density structures are not always aligned with the HCS but are more likely to be aligned with pseudostreamers related with new flux emergences appearing at higher latitudes. The denser regions that now spread more over latitude are associated with a negative longitudinal drift. We find that the structure rotates about 0.75°/day slower than the Carrington rotation. This result shows that the effect of the differential rotation is still visible at 3.5 RSun, although the structure might not spread above |±30°| at this radial distance. It suggests that the rotation of high-density structures is determined by the locations where they are magnetically connected to the surface of the Sun. Tomography offers reliable 3D electron density distributions in the corona, reproducing the slow temporal evolution of coronal structures over several rotations and in agreement with the solar cycle. The accurate knowledge of the rotation rate of large-scale structures (from the surface to higher altitude in the corona) could be used in the future to better connect the sources of the solar wind to their in situ counterparts, which in turn can provide valuable insight for future investigations with Solar Orbiter and Solar Probe Plus; in particular, Solar Orbiter will co-rotate with the Sun. This research has the potential to better constrain the radial density gradients, base densities for global MHD simulations and can be used as a reliable assessment for more realistic solar wind modelling. The development of the tomographic method combined with the MHD coronal modelling efforts can directly contribute to increase the reliability for future space weather forecasting. Peillon, C., Vibert, D., Frazin, R. A., de Patoul, J., & Lamy, P. (2014) Time-dependent tomographic reconstruction of the solar corona, Solar Information Processing Workshop.